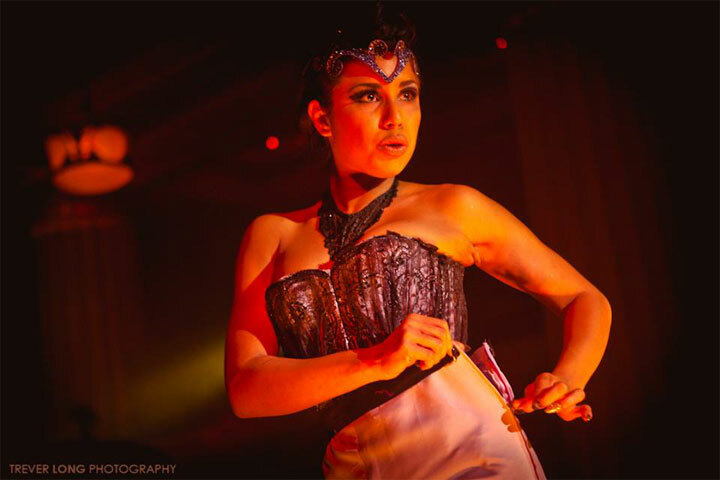 As the application period for this year’s Theatre Bizarre production nears its deadline, read about Darlinda Just Darlinda’s amazing experience at last year’s incredible event. If you want to apply to perform at Theatre Bizarre in 2014, you can find details below. Burlesque performers are considered alongside other variety acts, and those accepted will join an exceptional collection of all-star stripteasers who have joined previous Theatre Bizarre casts. Upon arriving at The Detroit Masonic Temple which housed Theatre Bizarre and The Dirty Devils Peep Show, I was greeted with an incredibly spooky feeling. This spooky feeling quickly turned into excitement as I walked by the makeup room where twenty or more people were being painted red and black and costumed like devils! I knew I was in for a treat! This scene was a far cry from when Roxi D’Lite invited me to The Dirty Devils Peepshow while we were sunning ourselves poolside in Vegas during the BHoF weekend. 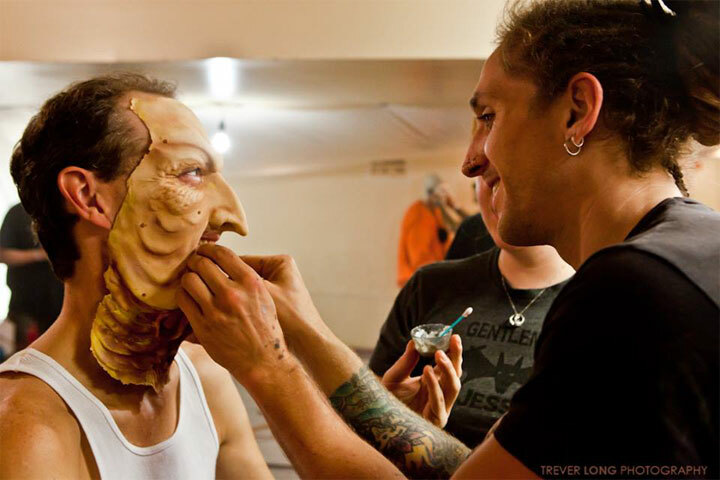 I had heard about Theatre Bizarre for years; John Dunivant, an extremely talented artist, is the mastermind behind a whole world of a haunted carnival. His paintbrush touches all mediums and using artists of all trades (sideshow, culinary, music, visual, performance, everything – really everything) he created this land in which the words ‘Hail Zombo’ are a common greeting! I knew it would be an awesome event, and would allow me a day to spend with Detroit living burlesque legend Toni Elling (I’m also happy to report Toni Elling is doing well! ), so that sweetened the deal! I had no idea that it was a 5,000 person theatrical experience until I walked by those devils in the costume room. Roxi had sent drivers to pick up my fellow hostel mates, Legs Malone, GiGi LaFemme and Kay Sera, and on arrival volunteers guided us through rooms with incredible art depicting a funeral procession and pictures of Zombo The Clown. Zombo is the leader of the world of Theatre Bizarre and this year’s theme was The Procession, which was the funeral procession of Zombo the Clown. Roxi had described this to me, but seeing this world in person far surpassed any description! There were different rooms for everything: a burlesque room for The Dirty Devils Peepshow, a side show room called ‘The Odditorium’, a kink room called ‘The Fistatorium’, the rock/ heavy metal room ‘The Asylum’, and the Ballroom. There was an ice cream shop, a ghost train and more. You can hardly see all of it in just one night! I went exploring, and the Masonic Temple was full of surprises: a bowling alley, a grand theatre that seated probably 1000 people, a indoor track, and many different temple rooms. The temple was a character all on its own at Theatre Bizarre! Then it was our call time, so I went backstage to start preparing. 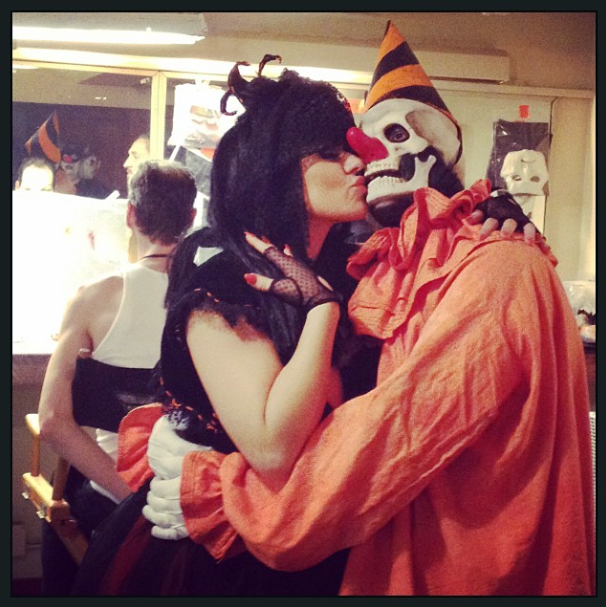 The backstage camaraderie was great – everyone was so excited to be there! I was really happy to see GiGi LaFemme; I don’t get to see her much since she’s moved to Nashville. 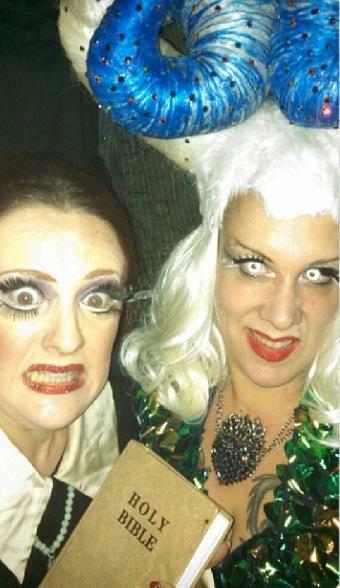 Tanya Cheex and I took a photo backstage where she was the devil and I was a pious religious lady. Watching Lola Martinet put on her makeup for her pinhead act was incredible. The show went without a hitch, except for GiGi throwing her bra literally in the Devil’s eye, which was entertaining! The main event was Zombo’s funeral procession, with a full brass marching band all in white, with Roxi D’Lite as Zombo’s wife weeping on top of Zombo’s coffin! What a spectacle! The funeral procession ended at the stage where Zombo’s eulogy was read and in true carny fashion Roxi did a striptease (I hope there are folks stripping at my funeral). And who popped out of the coffin? Zombo himself! There were gasps by the audience as no one had seen Zombo since he had died! It was so wonderful to see Roxi D’Lite in her world and see the incredible art Detroit has to offer. After the show, Roxi grabbed me, D’Arcy and Kalani and we explored. The most terrified I’ve been in a long time was riding the ghost train. There wasn’t room for me in the actual seats, so Roxi had me share a seat with the conductor. I obviously survived, but riding on a small one seat tractor going very fast in the dark was one scary experience! Then I went to find Legs and GiGi; we did some photo shoots and after we explored we took one ridiculous picture in the photo booth! With rumours of Detroit being in a post-apocalyptic state, my fiance, Scary Ben, had jokingly warned me about not being kidnapped by an army of cannibals. Low and behold, as I was leaving the Temple, who was sharing my elevator car? A band that was dressed like post-apocalyptic cannibals! Roxi and D’Arcy were fantastic hosts and we had a relaxing day after watching bad television and eating delicious food! On my way to visit with Toni Elling, D’Arcy took Russell Bruner and I to record an imaginary album in Motown! 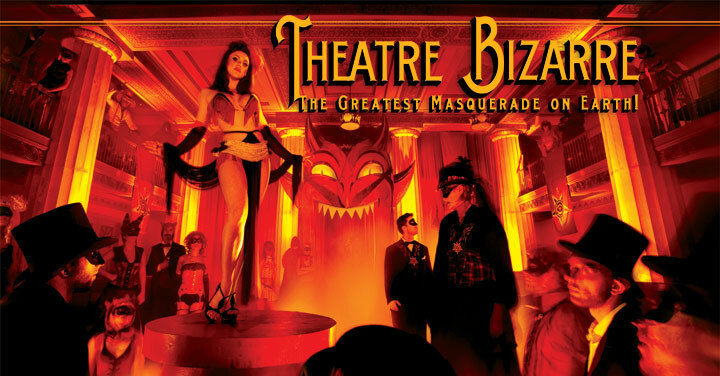 Words can hardly describe this event, so just make the pilgrimage to Theatre Bizarre in October 2014. The staff and volunteers for Theatre Bizarre were amazing and attending Theatre Bizarre is a MUST for anyone that loves art, theatre and the bizarre that our world has to offer! October 1st cutoff for Volunteers and Stage Hands.